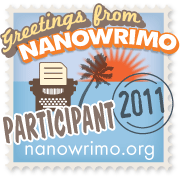 This month NaNoWriMo gives me permission to write what comes out of my heart. Yes, there's Reality TV. Yes there's Rock Band and a charismatic, philandering priest, and yes, there is a boy. Or two! I have scratched one novel, but some of it is reworking it's way into this one. I can't help it - it's not out of my system yet! Maybe I'll be able to let go after writing it all out. Maybe I'll be able to move forward with a new project, or maybe THIS will be my new project, and I'll get to have fun revising from December through May. I'll get to stop and think. But for now - just write! PS Oh my! Look at the time! I am driving into the city for a writer's lunch at my Gran's favorite restaurant, Henry's. This will be my first time driving in! My God du Jour for driving is Gladys - she is the Goddess of traffic and parking. Be with me Gladys! It's so cool that you're doing NaNo. Half my friends have been doing it for years, but this is my first attempt. You have me smoked. 9K+ in 48 hours!? Impressive. Congrats on your astounding word count! I love the joy and freedom during NaNoWriMo, though my word count is lower right now. Thank you for reminding me why I look forward to November every year. Happy writing! Whoo hoo NaNo buddies! I made it back from the city (thanks to Gladys) to read your comments and I'm all fired up that you guys are on this journey with me! I have to REALLY push myself this year to get out of my over-thinking rut. Don't think, write, right? . . .not sure how many words I'm up to. . I guess I could look. . .for me, the fun is writing the dialogue--which for me is pretty snappy quick. . .then I find interesting names for my characters. . . .and it flows from there. I'll go on over and add you as a bud. . .and maybe count my words. . .so much fun, Lena! Floyd yay! It IS fun, isn't it? Back to the magic of writing . . .
Steph - Thank you! We'll see if I can keep it up. Last year was an epic fail at only 10k. The year before I signed up but was too into my revisions of another book. This is the year I'm letting loose. But remember: One. Word. At. A. Time.